Farmers market season has begun and Cultivate KC is ensuring that community members across Kansas City, Kan., and Kansas City, Mo., will have access to fresh, quality, and healthy foods. Cultivate KC heads two different programs, New Roots for Refugees and Beans & Greens. 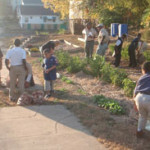 These programs are teaching residents gardening techniques, helping them grow a large array of fresh produce, and consistently producing fresh fruits and veggies that are made available at numerous farmers markets around KCK and KCMO. Cultivate KC isn’t just growing food; they’re taking the chance to educate, and empower community members to grow their own food. You can find produce grown by the Beans & Greens program and New Roots for Refugees at the Farmers Markets. 7:00 a.m. – 1:00 p.m.
3:00 p.m. – 7:30 p.m.
3:00 p.m. – 7:00 p.m.
6:00 a.m. – 3:00 p.m.
5:00 a.m. – 1:00 p.m. If you have a farmers market you’d like to add to this list, please email Andie Polk at aborchardtic@healthforward.org.